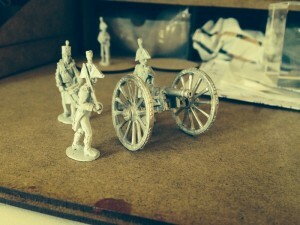 Alban Miniatures brings more cannons to the table with some more varieties being added to their Napoleonic Artillery Kickstarter. These beautifully sculpted 1/56 scale cannons are the work of master sculptor 'Ian Taylor', are cast in white metal and are designed to go with 28mm Alban Miniatures. To add yet more to the kick starter master sculptor 'Martin Baker' is sculpting artillery crews for each faction, to the same scale, starting with a British foot artillery crew. Why not pledge to bag yourself a bargain with this already part funded project. No money changes hands until, and unless, the project total listed by Alban is reached.